For the past few years, Intuition Ale Works in Jacksonville, Fla. has hosted an annual release party for their highly popular Underdark Imperial Stout. But, this year’s release, the third in the series has met with a snag. In a surprising email released Monday, May 18, 2015, Intuition owner Ben Davis has issued a recall for the entire release of 2015 Underdark. In the email, Davis sites that testing results indicate that the batch is infected with lactobacillus, a harmless but destructive type of bacteria that causes sour flavors to develop and is used in beers that are meant to have sour characteristics. Lacto, as it is known in beer circles, is a highly aggressive yeast that can easily run rampant in a brewing environment. The infection, Davis says, was traced back to one of the older bourbon barrels used to age the 2015 batch of Underdark. The brewery has expressed a concern that, because of the lacto infection, the beer in bottles may continue to ferment causing significant internal pressure on the glass and increasing the chance of the bottle exploding. Davis, recommends that unopened bottles of the beer should be stored in a cool place to minimize the rate of fermentation and that unopened bottles should be transported in a box for safety. It is also recommended that bottle should not be left in a car if it will be left alone in the heat for any length of time. Unopened bottles should be returned to the Intuition tap room at 720 King Street during its regular business hours of 3:00 p.m. to 11:00 p.m Tuesday through Friday and 1:00 p.m. to 11:00 p.m. on Saturdays. A cash refund of $15 or $25 tap room credit will be issued per unopened bottle. Read the entire email from Intuition owner Ben Davis below. The unopened bottles of 2015 Underdark should be returned to the Intuition Ale Works tap room at 720 King Street. We will issue a $15 cash refund per bottle, or $25 Intuition gift card per bottle that can be used towards purchases in our tap room. Please bring the Underdark bottles to the tap room in person during opening hours (Tues – Fri 3-11pm; Sat 1-11pm). It is illegal for us to accept shipments of beer and the beer could potentially explode during transit through the postal service. No refunds will be issued for opened bottles of Underdark. We have found there to be significant bottle-to-bottle variation in lactobacillus content and your bottle(s) of 2015 Underdark may not have developed sour flavors, especially if they have been stored in a cool environment. Please note, however, that the beer may sour as it ages. We sincerely apologize for any inconvenience this has caused you. We have recently hired a Quality Assurance manager to avoid repeat incidents in the future and for us to make the best beer possible going forward. We understand that many of you traveled to Jacksonville specifically for the release of this year’s Underdark vintage so there is no time limit for returning bottles and receiving a full refund or gift card. We deeply appreciate the trust you put in Intuition Ale Works and we thank you for your support. 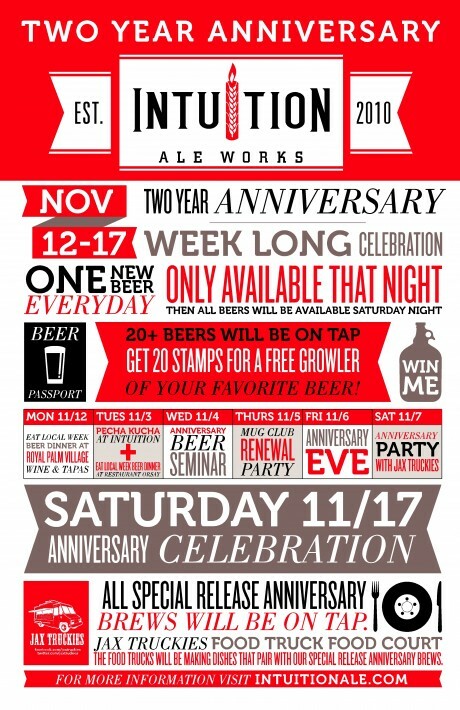 This week marks the beginning of Intuition Ale Works’ fourth anniversary celebration. During the week there will be a number of special events and one-off releases to celebrate with everything culminating on Saturday, November 22 at the brewery for a huge bash. As has been the custom over the past four years with the brewery, guests can purchase beer “Passports” that will be stamped each time one of the special brews is drunk. Try 20 or more of the special brews and you earn a growler of beer and can register to win a $100 tap room credit. Only 100 passports will be printed, so if you want to participate, get to the tap room Tuesday, November 18 at 3:00 p.m. to grab yours. Each beer will only be available the day it is released and Saturday the 22nd when all the beers will be available in the brewery and tap room. In addition to special beers, the brewery will be featured at a number of special events throughout the area. These events include a Belgian beer dinner at Black Sheep Restaurant, a beer and cheese pairing, tap takeovers and a special brunch as dinner event at Moxie Kitchen + Cocktails. Chef Waylon Rivers prepares a five course dinner served on the beautiful rooftop bar featuring a different Belgian-style beer brewed by Intuition with each course. Both the Riverside and Jacksonville Beach Bold Bean locations will be tapping a very special collaboration brew on Tuesday. The Intuition team worked closely with Bold Bean to create the Blonde Coffee Stout, a unique special release brew with oats, cocoa nibs and Brazilian coffee. The beer will only be available at Bold Bean and in very limited quantities, so when it’s gone, it’s gone! The beaches brew pub will feature seven Intuition brews on tap including: Barrel-Aged Amsterdam Falafel, Noir Belge, Double Elimination, Truck Stop Stout and three core beers. Join the Intuition crew at World of Beer Southside for the biggest Intuition tap takeover ever! WOB will be pouring at least 20 of Intuition brews starting at 6:00 p.m. In addition there will be fun swag giveaways. The brewery partners with Jaxsons Night Market this month to celebrate beer, food and community. Contributors to their cookbook, Cooking with Intuition, will be selling a number of dishes prepared with Intuition brews at the Market and Cari will be selling signed copies of the cookbook. 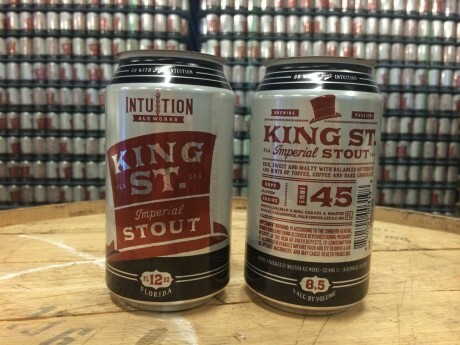 Also, cans of King Street Stout will be available at the Intuition Biergarten for the first time outside of the tap room. Intuition and Moxie celebrate their shared anniversary with Brunch for Dinner on Friday night starting at 10:00 p.m. This late-night bash will feature an incredible lineup of beers all paired with Chef Tom Gray’s brunch-inspired small plates. Featured beers include Duuuvaaal, Shotgun Shack and several brunch-themed beers brewed just for the occasion. The party starts at 1:00 p.m. and will feature a long list of special release and barrel-aged brews created just for the occasion. Add to that food trucks in the street featuring fare by Funkadelic and Driftwood BBQ, on-site t-shirt printing by Fretto Prints and a raffle to support the Florida craft beer political committee with a chance to win a Yeti cooler bag customized by Burro Bags or an UNDERDARK package that includes bottles of all three vintages and lots of swag, and you have the makings of an epic party. Shake off an epic week with a Hangover Brunch at Mellow Mushroom Avondale on Sunday morning. The ‘Shroom will feature 10 of Intuition brews on tap to pair with their already awesome brunch menu, including some breakfast one-offs and the return of Contraption, a special release double IPA. King Street Beer District co-anchor Intuition Ale Works was the first brewery in Florida to can beers. The initial release included the brewery’s flagship People’s Pale Ale, their popular West Coast-style IPA, I-10 IPA and their easy-drinking Jon Boat Coastal Ale. Along the way there was at least one cancelled release — the popular Belgian-style brew known as Duuuvaaal — because of a dispute with a Belgian brewery with a similar name. But, in perhaps one of the most anticipated announcements from the brewery, Cari Sanchez-Potter posted to Facebook and the brewery’s blog that King Street Stout will make its debut in cans August 2. According to the company’s website King Street Stout is an, “Imperial stout brewed with two-row malted barley and a variety of roasted and caramel malts.” Tasters will notice notes of coffee, chocolate and rich malts in this deep, black brew. Though the beer will be packaged in 12-ounce cans, at 8.4% ABV one can easily serves two when poured into snifters. King Street will be available in 4-packs and retail for $10.99 at the brewery’s tap room for the first few months. 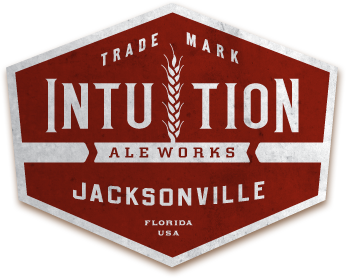 Intuition will be brewing two limited release beers for One Spark 2014 instead of just one like last year. According to a press release from the brewery, demand for last year’s One Spark Kölsch was so high that the decision was made to add another brew to the lineup this year. In addition to One Spark Kölsch, a smooth German-style ale with mild hops and a crisp finish inspired by the kölsch beers of Cologne, Germany, Intuition will brew One Spark Alt. The new beer is inspired by the altbiers brewed in Dusseldorf, Germany and is an amber malty brew with a smooth finish. Interestingly, the beers are examples of the two ale styles produced in otherwise lager-dominated Germany. 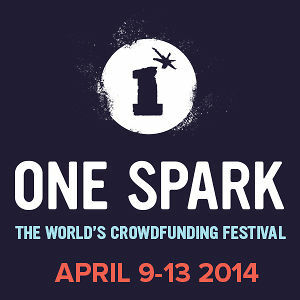 One Spark is a five-day event that connects people with great ideas to the resources they need to bring those ideas to fruition. The festival runs from April 9 to April 13, 2014 in a 20-square-block, multi-Venue gallery in downtown Jacksonville, Fla. Artists, entrepreneurs and innovators display their ideas for all to see and vote on. Attendees vote on the projects they like the best to distribute nearly $300,000 in funds. Davis has proven to be an outspoken and unwavering downtown advocate with his involvement in the afore mentioned Downtown is on Fire campaign. His Smoke IPA was inspired by and created exclusively for downtown Jacksonville only as part of the movement and should be appearing on tap at bars and restaurants in the city core now. 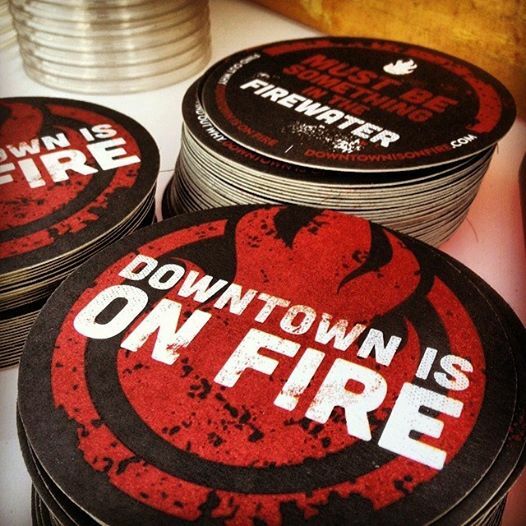 For a list of locations serving Smoke IPA, go to the Downtown Marketing Collaborative’s website: http://www.downtownisonfire.com/promotions. One Spark and One Spark Alt will be available on draft at the One Spark Festival in the San Marco Dining District Food Village and at beer kiosks set up throughout downtown Jacksonville during the festival. Last night there was a party on the roof of the Museum of Science and History (MOSH) to kickstart the Downtown is on Fire movement. In a nutshell the movement’s goal is to showcase downtown Jacksonville to the rest of the city and the world as a place that is hip, happening and a whole lot of fun. There were speeches from local shakers and movers like Terry Lorrince, Executive Director of Downtown Vision, Inc., David Wingard of Wingard Creative, the masterminds behind the Downtown is on Fire initiative, Ben Davis owner of Intuition Ale Works and Bill Prescott of the initiative itself. But, the star of the event was the beer. Ben and his creative team at Intuition created a beer specifically for sale only in downtown Jacksonville named Smoke IPA. As the name indicates, the beer is made with malts smoked with cherry and oak woods that give it a delicious smokey and sweet quality you will be hard pressed to find in any other IPA on the market. The name of the beer — as well as the downtown initiative — are nods to the Great Jacksonville Fire of 1901. In eight hours, the fire burned 146 city blocks, destroyed more than 2,368 buildings, and left almost 10,000 residents homeless. It is said the glow from the flames could be seen in Savannah, Ga, and the smoke plumes in Raleigh, NC. One of those sparks is the beer created by Intuition. The Florida Times-Union’s Matt About Jax caught a bit about the beer on video at the event. Watch it at the link below. Once per year Intuition Ale Works releases a beer that has become a legend in the craft beer community. 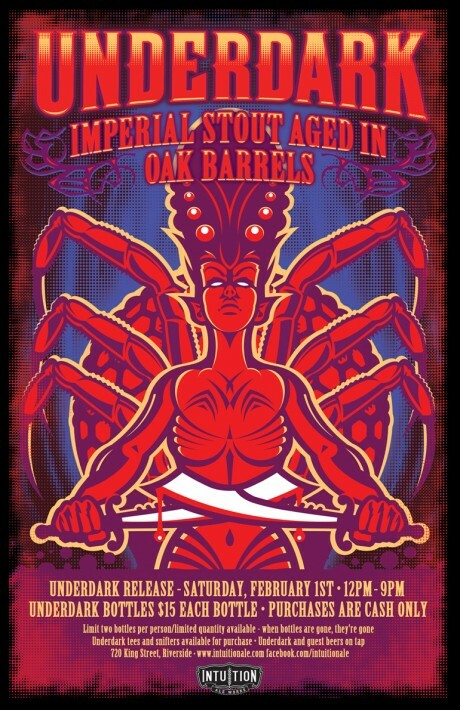 This year, on Saturday February 1st, the brewery will release their coveted Underdark Imperials Stout. Last year’s release of the inky black brew garnered rave reviews at RateBeer.com earning 98 out of 100 points. On Beeradvocate.com the brew attained 94 out of 100 and an Outstanding rating. 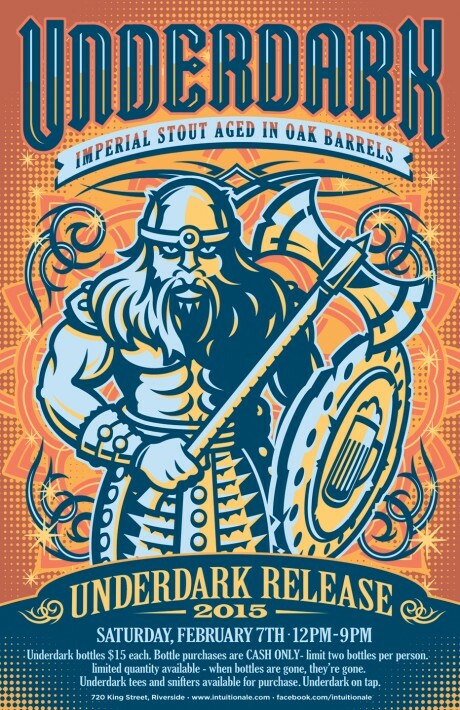 Underdark is a mixture of several of Inuition’s other, popular beers King Street and Truck Stop Stouts that has been aged in bourbon barrels. The brewery has stated in an email newsletter that they set aside a limited quantity of last year’s release so that beer lovers could compare the beer with some age on it side-by-side with the new release. As is fitting of such a huge release, the brewery is throwing a party and will shut down King Street like they did for their anniversary in November. In addition to Underdark, there will be a number of guest beers on tap. Hungry party-goers can chow down from two food trucks: Funkadelic and Chew Chew. The 2014 release of Underdark bomber bottles will go on sale at 12:00 noon for $15 each. Purchasers must show a valid government-issued ID to purchase. A strict limit of two bottles per person will be adhered to. In addition to the beer, Underdark t-shirts ($20) and snifters ($6) will be available.